Rival Group is a time-proved company that develops, manufactures and distributes aluminium and steel skid plates for a wide range of vehicles, accessories for ATV and 4x4. With the modern high-capacity production that allows production of up to 700,000 skid plates per year, Rival closely cooperates with the official car dealers. The presence of own R&D department guarantees regular renewal and improvement of the products. In its performance attributes, Rival excels both domestically and foreign produced products. With the Rival skid plate you will protect the undercarriage of your vehicle from running over curbs, rocks, road debris and make it safe to use in off-road environments. 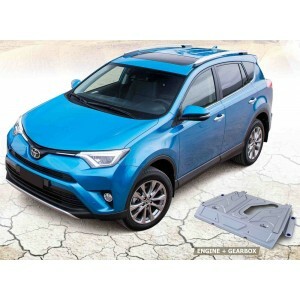 The Rival skid plates will also protect your car's anti-theft device from being tampered with or cut by thieves. Its aerodynamic design will reduce air turbulence and make your car run more efficiently, easily offsetting the extra weight of the metal plate. Installation is easy with the complete hardware kit and no-drill installation. Rival skid plate is not an option, but a necessity. This product is perfect not only for off roaders, hunters, forestry workers, construction companies, tuners, low riders, hunters but for anyone who wants to protect their loved ones from radiator, transmission or gearbox damage when they are not around to help.